Digital Communications & Social Media Strategist. Cocktail Enthusiast. Laptop Bag Aficionado. Kate likes to think that she invented the Internet ... but knows that wouldn't be fair to Al Gore. Instead, she contents herself with her invention of "The Canadian" - a surprisingly refreshing cocktail containing Wild Turkey, gingerale, cranberry juice and a dash of lime - and "The Ben Franklin" - her first foray into using bitters in cocktail recipes. When she's not inventing refreshing cocktails, Kate Trgovac can be found online, helping companies large and small communicate with their customers. After over 20 years as an online marketer, she’s seen many digital marketing platforms come and go (remember gopher?! ), but the principles remain the same: engage your community’s passion! After spending time at several digital agencies, software shops and startups, in Toronto and Vancouver, Kate co-founded LintBucket Media -- a boutique marketing agency headquartered in Vancouver that specializes in online marketing, social media marketing & training, and digital content creation. Over the years, Kate’s clients have included large corporations like Suncor Energy and Maple Leaf Foods as well as social startups like Kinzin (social networking for families), Osmosus (a social network for green living) and SavvyMom (a social site for moms). In addition to stirring up trouble (and winning awards) for amazing clients, Kate loves teaching. She has been a lecturer at the University of British Columbia and the University of Toronto's Faculty of Information Studies, teaching courses on Social Media Fundamentals and Web Personalization. In addition to teaching, Kate is a regular speaker at marketing industry events across the country. She also runs a workshop on social media tools for small business and non-profits. Kate served on the digital committee for the Canadian Marketing Association as well as the Advertiser’s Council of the Interactive Advertising Bureau of Canada. She is a leading authority on social media and is often quoted in mainstream media, including CBC, Inc Magazine, the National Post, the Montreal Gazette and Marketing Magazine. She was the technical editor for a recent popular book on social media, Friends with Benefits: A Social Media Marketing Handbook. 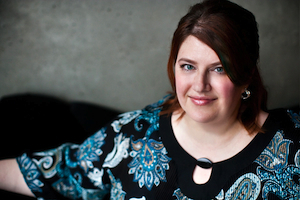 She has also been designated one of Canada's Most Influential Women in Social Media. Kate was the Publisher and Editor-In-Chief of One Degree, a gathering place for Canadian Online Marketers. On the creative side of things, Kate writes about social media, technology, design and other topics of note at her blog, mynameiskate.ca. Kate has also co-authored a play, The Meeting, that lampoons the interactive agency world. And for something a little different, Kate also writes about Funky, Chic and Cool Laptop bags and regularly advises bag designers on both function and fashion as well as how to market their creations. In collaboration with Rainebrooke Designs, she has designed her own laptop bag, the Funchico. Kate has a BA from Trinity University (San Antonio) in ritual theory and philosophy, two surprisingly helpful disciplines in the high-tech, high-touch world of interactive marketing. She lives in downtown Vancouver with her wife and business partner, Rosemary Rowe, and her junkyard Shar-pei, Emmy Lou. Kate Trgovac is a digital marketer and social media strategist. She is co-founder and President of LintBucket Media, a boutique marketing agency headquartered in Vancouver that specializes in online marketing, social media marketing & training, and digital content creation. Kate writes about marketing, design and technology on her marketing blog MyNameIsKate.ca.